Ban Ki-moon, the eighth Secretary-General of the United Nations, gave an address at the inaugural ceremony for Boston University’s Global Development Policy Center on Wednesday at the Frederick S. Pardee School of Global Studies. Ban discussed some of the current challenges in international development, highlighting climate change, and presented opportunities for the GDP Center to address those challenges. BU President Robert Brown spoke at the ceremony, saying he was enthusiastic about the future of the GDP Center as a space for collaboration. Kevin Gallagher, the director of the GDP Center, said during the ceremony that the mission of the center is to advance policy-oriented research on financial stability, human well-being and environmental integrity worldwide. Graham Dow, a biology professor at BU, said he attended the event to hear Ban’s perspective and to aid his own research on plant biology. During the ceremony, Ban said the GDP Center will be especially beneficial for students in the current era of global change who want to conduct research on impactful contemporary topics. Ban said despite the “tempestuous times” the world currently faces, he sees hope in working together for a sustainable future. Ban emphasized youth and women’s empowerment movements as signs of hope. Pardee Dean Adil Najam said he thinks Ban gave the exact right message and that he could not imagine a better person to represent the GDP Center. Najam said he thinks the GDP Center will be a central element in strategy at Pardee. He hopes the center will become a university hub for all issues related to international development. Rebecca Cowing, the GDP Center administrator, said she thinks Ban’s remarks were relevant to both the GDP Center and the modern world. She said Ban challenged the center to improve its leadership and follow through with its mission. “We need to connect what we’re doing here at the university and at the center to people that can make a difference, like policy makers and the leaders of our cities, our country and the world,” Cowing said. Saliha Agha, a Pardee graduate, said to see Ban speaking at the school was a proud moment for her. Natasha Patel, also a Pardee graduate, said she found Ban’s perspective on climate politics and the current political climate interesting. Cowing said the center reached out to a variety of offices across campus for help planning the event. 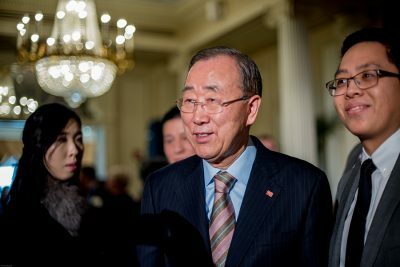 BU spokesman Colin Riley said the opportunity for students to hear directly from Ban Ki-moon was unique, and will aid the work they do once they graduate. “Having the former Secretary-General, who understands global issues and the role the U.S. can play in them and the educational opportunities for students at Pardee, is really beneficial for these students,” Riley said.